For many animal lovers, it is the hard-working huskies that are the highlight of a winter trip inside the Arctic Circle, and our Husky Sled Adventurer package has been designed exactly with them in mind. This three or four-night break includes two thrilling excursions that will give you plenty of opportunities to befriend these beautiful creatures and marvel at their eager enthusiasm for work – a Northern Lights Husky Safari and then a full day Husky Adventure! This trip offers the chance to explore Lapland by husky, discover the beauty of Karesuando and the surrounding area and, if that's not quite enough, there are numerous optional excursions that you can book to make your holiday even more special. There’s plenty of time on the four-night breaks to relax and take things at a leisurely pace. 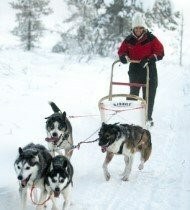 Your Husky Sled Adventurer break begins with a flight from your chosen UK airport to Enontekio in northern Finland. From here, you will make the 50 minute transfer to Karesuando - a spectacular journey, travelling through the majestic forests and passing countless frozen lakes. The charming village of Karesuando will then be the base for your Arctic adventure, from where you will venture out on the exciting activities detailed below before flying back from Enontekio. We’ll organise the running order according to the local conditions while you’re there so a set itinerary will be provided at a later date. 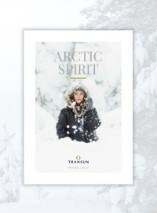 You will also have the opportunity to choose from our programme of optional excursions: maybe try your hand at snowmobiling or spend a night in an igloo – a definite highlight of our Arctic Spirit programmes! Take a magical evening safari on a sledge pulled by a team of dogs, hopefully travelling under the beautiful Northern Lights (of course, this cannot be guaranteed). Two adults share a sled and dog team. Enjoy travelling through the snow-clad forest with your dog team, stopping for a warming lunch amidst the wilderness, before returning to the husky farm, where your dogs will at last enjoy a well-earned rest and perhaps a treat or two! 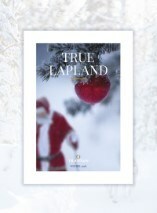 I know it can get cold in Lapland but how cold? Temperatures rarely rise above freezing temperatures usually ranging between -7C and -35C. You will need a series of base layers under your thermal suit. Those needing thermal suits outside the usual children’s sizes and adult small/medium/large range are recommended to buy their own before travelling, to avoid disappointment with the limited sizes. Will my party be in the same excursion groups if I make seperate bookings? When booking online or over the phone, please note that we can only guarantee that guests will be in the same excursion groups if they are all under the same booking reference. Therefore, if you are two or more families travelling together it is advisable that you book together.